In April Jessica at Dairy Free Betty posted about her Foodie Pen Pal. I thought the whole thing looked like so much fun that I just had to join in too! The best part of blogging is connecting with my readers or with other bloggers, and this is a perfect way to do it! Plus, once a month you get a fun surprise in the mail- and who doesn't love getting packages?? This month was my first experience and it's been amazing! Both bloggers that I have been paired up with are awesome and I have really enjoyed being in touch with them and following their blogs. My Foodie Pen Pal was Beth at Its Good to be the Cook and she is awesome! She emailed me at the beginning and asked what my food intolerances were, and made sure everything in the box was 100% dairy free. My package came during a week that had been more than a little rough, so when it arrived on my doorstep really brightened my entire week. Of course the minute it arrived I just had to tear into it to see what goodies I would find. I had help too- my daughters were just as excited to see what was in the box as I was! She sent me a box was full of treats from my very favorite store-Trader Joes! Surprisingly though I hadn't yet tried some of the goodies Beth included in the box. The first thing I did was read through the little booklet she put together for me. She included a very sweet note, a detailed list of what was in the box, and some of her favorite recipes. I absolutely love it and the booklet now resides on the rack in my kitchen with all my special cookbooks. Balsamic vinegar: I haven't opened this yet, but I know it will get a lot of use since we love cooking with vinegar. TJ's Garlic Infused Organic Olive Oil: This olive oil is my new favorite and will be a staple in my kitchen from now on. I've used it in Aglio Olio, on roasted green beans, and over plain pasta. It's so good! Lemon Pepper Pappardelle: One of my favorite pastas. It makes a great aglio olio, or is good all on it's own. Sweet Chili Sauce: We hadn't tried this before and I am honestly not sure how I missed it! I have dipped some chicken in it- so good! I can't wait to cook with it. Beth suggested using it in a marinade and that is something I cannot wait to try. It's a little tangy, a little sweet, and just a touch spicy- the perfect flavor combination in my opinion. Crimson Blossom Green Tea: I am a huge tea lover and am always on the hunt for new teas to try, so of course this was one of my very favorite surprises in the box. It's a sweet, fruity light tea . To me there is nothing better than a good cup of tea in my favorite mug, and a good book. Even though summer isn't really hot tea season, this one has that summery taste to it. Of course, it would make a delicious iced tea too! Sugar, Chocolate, and Coffee Grinder: There are no words for this! It makes an average cup of coffee taste like it's from a coffee shop. Or you can grind it over top of toast. Peanut Butter Pretzels: Already a family favorite-I've had to chase my husband away from them several times already! Thank you so much Beth for my wonderful box of foodie goodies! It was wonderful and we are still enjoying all the goodies you sent. If you would like to see what I sent my Foodie Pen Pal head on over to Edible Obsessions. 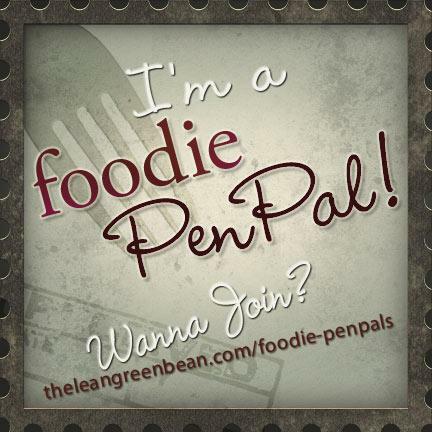 Are you interested in being a Foodie Pen Pal? It's open to all bloggers and readers. All you have to do is visit Lindsay's site, The Lean Green Bean, for sign up details. I hope you'll join us next month! Your welcome Steph! I'm so glad to see you and the fam liked it :) Also happy to have a new blog-friend! Love your site! So glad it worked out so well for you!! It's sooo much fun!! Too bad you're in Canada and we'll never get paired up. :-( I'd love to send you some of my favorite Trader Joes goodies! That all sounds awesome!! I've seen other people using the pappardelle and never had the opportunity myself since I don't live near TJ's. Maybe you could find something similar at a specialty food store near you? I have seen similar products in other stores. It is so good- especially tossed with some fresh sauteed veggies and olive oil. One of our favorite meals. Steph, Thank you again! I have to say that the bar is set pretty high for future pen palers :) And I have a friend picking me up more of the coffee next week when she's in the OBX :) cheers! You are more than welcome!! I sent you the ordering information for the Front Porch Cafe and Kill Devil Roasters (where I got the coffee from) They do ship:-) And I believe they offer free shipping on a certain amount. If you want I can send you the information. I hope someday you make it down to the OBX- I think you would love it!! We are headed there in just a few weeks for our annual week long vacation there.